(Nanowerk News) At the National Institute for Materials Science, Senior Researcher Kazunori Sugiyasu and co-workers (Polymer Materials Unit, Advanced Key Technologies Division) developed a method for preprogramming the timing of molecules to initiate self-organization by mixing molecules with modified side chains. The results of this research will be published in the German Chemical Society’s journal Angewandte Chemie International Edition ("Kinetic Control over Pathway Complexity in Supramolecular Polymerization through Modulating the Energy Landscape by Rational Molecular Design"). (a) Previously reported porphyrin molecule 1; (b) two kinds of self-organization in which porphyrin molecule 1 is able to take part. A particulate structure is formed early, but that disappears with time and then a fibrous structure is formed; (c) self-organization involving molecule 1 to form a fibrous structure begins in about four hours. Molecular self-organization is widely observed in nature, and is a critical phenomenon in terms of developing systems that perform complex functions as seen in such natural mechanisms as photosynthesis and neurocircuits. 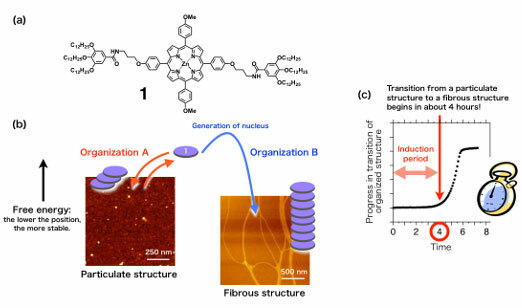 Attempts have been made to develop new materials capable of executing advanced functions using the principle behind the phenomenon of molecular self-organization. However, due to the spontaneous nature of molecular self-organization, it is extremely difficult to control the phenomenon by design. In particular, almost no research had been conducted to control the timing of the self-organization phenomenon including control of when to initiate it. Recently, we conducted research using a molecule that can form two types of self-organized structures. One type of the self-organized structures was quickly formed but was energetically unstable; therefore, after a certain period of time elapsed, the other type of the self-organized structures, which was energetically more stable, was eventually formed. By modifying the side chains of the molecule, thereby inverting the energy stability levels between the two types of self-organized structures, we were able to synthesize a new type of molecule that only forms the former self-organized structure. By changing the mixing ratios between the original and new molecules, we succeeded for the first time in the world in controlling the timing at which an energetically stable self-organized structure begins to form. Controlling such timing is similar to the mechanism behind the biological clock in organisms from the viewpoint that in both cases, such time-controlling process is carried out by a network of molecules consisting of several chemical species. Self-organization is a vital concept in diverse fields such as materials science, nanotechnology and biotechnology, and is attracting much attention as a new method of synthesizing materials. By applying the method we developed in this research, we intend to develop advanced systems that are capable of emitting light or changing electrical conductivity at desirable timings. In the future, we hope to develop smart materials that autonomously function corresponding to the passing of time, like biomolecular systems do.